Sea of Thieves has received several updates since its launch in March 2018 and many more are coming to improve the game. In a video interview recorded by Gamereactor during the Fun and Serious Festival in Bilbao, Executive Producer Joe Neate talked about the main systems and modes coming to PvE and PvP. As for the former, an enhanced quest system is being worked on right now. 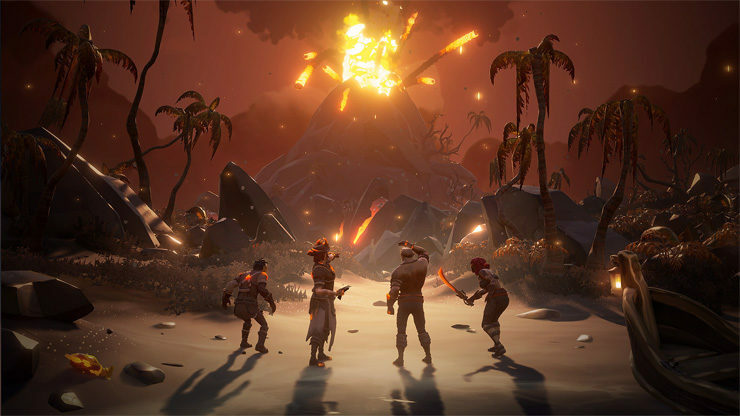 I think it’s fair to say Sea of Thieves at launch appealed to a certain range of players that love that freeform creativity, kind of having their own adventures in this shared world, and almost our quest system gives you a little nudge but that’s not the only thing that you chase. But for some people that want guided goals, they want lore, they want story, we know that we’re underserving players, but we’ve proven that we can do it and that it works in the shared world with campaigns we’ve done around the Hungering Deep or Cursed Sails where you put lore, put story in. We’ve had a team working on basically a new and improved quest system around story and lore in this shared world for quite a while now actually, and it was originally planned to be our fourth update, but we actually moved it back to next year because we wanted to add and grow. We saw the potential in it and we wanted to really, fully do it justice. So yeah, there’s a team working on that, has been for quite a while and will be for a little while more, but I think when we bring that into the game it’s gonna appeal to those people that want that crafted lore, want that adventure, want that story, and also appealing to maybe single players as well. You know, those players that want to go out and maybe they want to live a story, maybe they don’t want to be that social. There’s a lot of stuff going on at the studio right now about that. Meanwhile, PvP fans are eager to get their hands on the competitive focused Arena mode announced a couple months ago. According to Neate, it will be in the hands of Sea of Thieves Pioneers very soon. We’re playtesting Arena. We want to get it into our Pioneers community program early in the new year, so we are just trying to nail down that almost MVP of an experience. It’s kind of all the best bits of Sea of Thieves condensed down, it’s treasure hunting, it’s battling at high intensity, high speed. Even though it uses a lot of the same mechanics, it feels very different. As soon as you put on that competitive slant, it changes how you feel about certain things. We’re making tweaks to that core experience to facilitate Arena and competitive play. It’s actually I think it’s more of a challenge than it seemed initially. We want to get this out early, like a rough version of it, and just test how it works and get feedback. We’ll probably make lots of changes and iterations with our players before we bring it to the wider audience, because we want it to be the best it can be. In closing, Joe Neate said ‘Adventure’, the traditional mode of the game, and Arena will be supported as two platforms going forward. Are you eager to see these new features and modes make it into Sea of Thieves? Let us know in the comments!